East Timor with its capital Dili is located in Oceania (Southeastern Asia, northwest of Australia in the Lesser Sunda Islands at the eastern end of the Indonesian archipelago; note - Timor-Leste includes the eastern half of the island of Timor). It covers some 14,875 square kilometers (slightly larger than Connecticut) with 1,291,360 citizens. Portuguese, Indonesian and English are the common languages used in East Timor (consider regional differences). Interesting info Indonesia is the only bordering country. East Timor is a country in Southeast Asia. It lies northwest of Australia in the Lesser Sunda Islands at the eastern end of the Indonesian archipelago. East Timor has some of the best scuba diving in the world, and this is a major draw for tourists with East Timor shore diving becoming known worldwide amongst the diving community. Pristine beaches and coral reefs stand in stark contrast to one of the poorest populations on Earth. Carnival de Timor is the annual festival held in Dili in middle of April (sometimes in May, depending on rain season). Initiated by the Ministry of Tourism in 2010, Carnival de Timor is all about fun, music and multiculturalism. Both modern and traditional costumes, East Timorese and foreign minorities, even embassies also participate in this annual festival. The landscape is mountainous. The average density of population is about 87 per km². The climate in East Timor can be described as tropicalhot, humid, distinct rainy and dry seasons. Potential threats by nature are earthquakes, floods and landslides are common, tropical cyclones and tsunamis. To reach someone East Timor dial +670 prior to a number. The local cellular networks are operated on 850 MHz, 900 MHz, 1800 MHz, 3G, 4G. Websites typically end with the top level domain ".tp". If you want to bring electric appliances (e.g. battery chaarger), keep in min the local 220 V - 50 Hz (plugs: C, E, F, I). The sign for the locally used currency Dollar is USD. 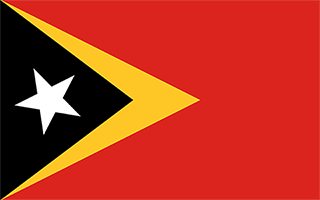 Red with a black isosceles triangle (based on the hoist side) superimposed on a slightly longer yellow arrowhead that extends to the center of the flag; a white star - pointing to the upper hoist-side corner of the flag - is in the center of the black triangle; yellow denotes the colonialism in Timor-Leste's past; black represents the obscurantism that needs to be overcome; red stands for the national liberation struggle; the white star symbolizes peace and serves as a guiding light.